Thousands of feet underneath the shifting ice sheets of Antarctica lurks one of the world’s greatest evolutionary success stories. A variety of distinct fish species, collectively called the notothenioids, have developed the ability to avoid freezing under extreme conditions through the evolution of antifreeze glycoproteins. Today, these fish make up approximately 75% of the biodiversity and 95% of the biomass in Antarctica. Their story not only illustrates how relatively small changes in temperature have led to major differences in species survival but also the consequences that global warming may have on this intrepid family of fish. The story of the notothenioids begins roughly 40 million years ago with the separation of Antarctica from the supercontinent Gondwana. The split led to the creation of an isolated continent and the Antarctic Circumpolar Current. Driven by strong westerly winds found in the latitudes of the Southern Ocean, the Antarctic Circumpolar Current blocked warm water from reaching Antarctica’s shores. Antarctica’s formerly tropic climate shifted dramatically and the temperature plummeted. These changes exerted great evolutionary pressure on the endemic species of the region and, for many species, resulted in mass extinction. The notothenioids would have likely suffered the same fate as their relatives had it not been for the evolution of antifreeze glycoproteins approximately 35 million years ago. Antarctic marine fish drink water that contains small ice crystals. Antifreeze proteins bind to the crystals and prevent their growth, which otherwise would lead to complete freezing of the organism. However, the exact mechanism of action for these antifreeze proteins is still poorly understood. Aethotaxis mitopteryx. This specimen was captured at 580 m in the Bransfield Strait. This specimen is approximately 20 cm in length. Courtesy of Dr. Thomas Near, Yale Department of Ecology and Evolutionary Biology. For many years, researchers argued that the evolution of antifreeze glycoproteins was the driver of the diversification of Antarctica notothenioids. In a recent paper, Yale University researcher Dr. Thomas Near instead suggests that the spread and diversification of the notothenioids is due to climate change events occurring at least 10 million years following the evolution of these proteins. Near states that while antifreeze glycoproteins are critical for notothenioid survival, the morphological and ecological diversity in Antarctic notothenioids is correlated with events of the Late Miocene, a time period approximately 11.6 to 5.3 million years ago. During the Middle Miocene, approximately 20 to 15 million years ago, a warming occurred in Antarctica that resulted in temperatures significantly higher than those today, causing the melting and shifting of ice sheets in Antarctica. “This ice destruction,” reports Near, “may have led to the extirpation of [many Antarctic species] and created all these open niches for notothenioids to occupy and subsequently diversify.” The subsequent Middle Miocene Climatic Transition led to the polar conditions that exist today in Antarctica. This period of climatic turmoil resulted in the extinction of many of the notothenioids’ competitors and a changed geographic environment. The notothenioids expanded into open niches and became physically and thermally isolated by the cooling temperatures of the Middle Miocene Climatic Transition. Near states, “It is thought that dynamic history of ice, the climatic history of Antarctica, has also led to a very dynamic physical environment of Antarctica.” These conditions may account for the evolution of the hundreds of different species of notothenioids that exist today. 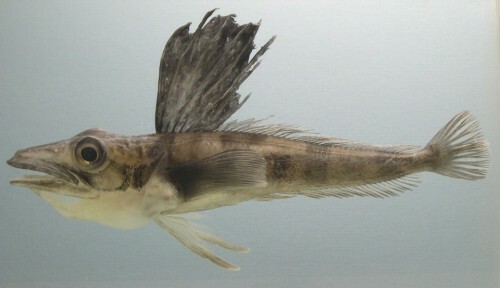 Chionodraco myersi, an “icefish” that lacks hemoglobin. This specimen was captured at 250 m near the South Orkney Islands. The specimen is approximately 40 cm in length. Courtesy of Dr. Thomas Near, Yale Department of Ecology and Evolutionary Biology. Regardless of the thermal consequences, there will be other new pressures on notothenioid survival. As temperatures rise in Antarctica, invasive species, likely from South America, may move into the territory of notothenioids. King crabs that eat hard-shelled organisms have already begun their march into the Southern Ocean. Whether these invasive species directly target the notothenioids or target the krill that notothenioids rely on for food, they may fundamentally disrupt Antarctica’s food webs. Realistically, a combination of the physiological stress imposed by changing climate conditions and the ecological impacts of altering the overall compositions of these communities will severely threaten notothenioid survival. Pogonophryne barsukovi. This specimen was captured at 320 m near the South Orkney Islands. The specimen is approximately 20 cm in length. Courtesy of Dr. Thomas Near, Yale Department of Ecology and Evolutionary Biology. Fishermen in Chile, the Faukland Islands, and South Georgia may be the first to recognize the consequences that notothenioid extinction would bring. In these regions, the Antarctic notothenioid called the Chilean Sea Bass is actively fished and considered an economically viable resource. Further, the antifreeze glycoproteins found in these fish have countless applications, ranging from increasing the shelf life of frozen foods to enhancing preservation of tissues for transplant or transfusion in medicine. In fact, these proteins can already be found in certain types of popsicles and ice cream bars. Perhaps more devastating than the economic consequences caused by the extinction of the notothenioids would be the devastation to an ecological community that has a rich 35-million-year-old history. According to Near, the notothenioids “represent a canary in a coal-mine…when you have a continental ecosystem potentially taking a dive, that just raises a lot of warnings for unanticipated consequences that we would see elsewhere.” If the notothenioids begin to disappear, humans may see what happens when an entire ecosystem is turned inside out. Dr. Near and his associates on a trip to Antarctica. Courtesy of Dr. Thomas Near, Yale Department of Ecology and Evolutionary Biology. Lara Boyle is a senior in Branford majoring in Biology with a focus in neurobiology. She is the Outreach Chair for the Yale Scientific Magazine and works in Professor Schafe’s lab studying the changes in gene expression and synapse regulation that appear with Post-Traumatic Stress Disorder. The author would like to thank Dr. Thomas Near for the interesting and enlightening conversation about his work. Sidell, B., and O’Brien, K, When bad things happen to good fish: the loss of hemoglobin expression in Antarctic icefishes. The Journal of Experimental Biology 209, 1791-1802 (2006). Near, T., Parker, S., and Detrich III, H. A Genomic Fossil Reveals Key Steps in Hemoglobin Loss by the Antarctic Icefishes. Molecular Biology Evolution 23 (11), 2008-2016 (2006). Near, T., Dornburg, A., Kuhn, K., Eastman, J., Pennington, J., Patarello, T., Zane, L., Fernandez, D., and Jones, C. Ancient Climate Change, Antifreeze, and the Evolutionary Diversification of Antarctic fishes. Proceedings of the National Academy of Sciences (2012). 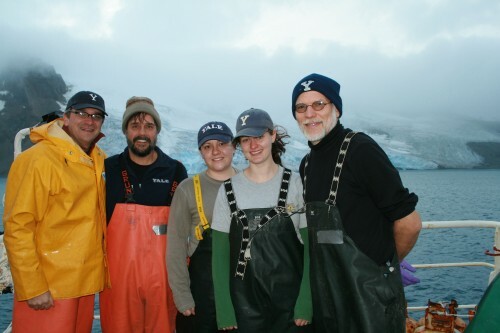 La Mesa, M., Eastman J., Vacchi, M. The role of notothenioid fish in the food web of the Ross Sea shelf waters: A review. Polar Biology. 27, 321-328 (2004).